Simultaneous 12 Lead Diagnostic Acquisition. WINDOWS: Point & Click User Interface. Real-Time 3, 6 or 12 Lead Color Display of ECG Complex. Full Patient Demographics & Information. HR w/ Global Measurements, Complete Interval Values & ST information. Capture Unlimited ECG Durations of Patient ECG Data to Hard Drive or any Storage Medium. User Selectable Lead Formats on Final ECG Report. Print Final Report to Non-fading Laser Hard Copy (Color or black & white). Complete Test Storage of ECG Data to Hard Disk, Floppy or Optical. Twelve Preprogrammed Protocols with 10 User Defined Protocols each with 40 Stages. View / Print Full Disclosure Measurements for all Stages, ST max. / ST avg. On-screen Status of Test: Phase Time, Total Time, Speed, Grade, Target HR, 12 Lead ST Levels & Slopes. Report Transmission via Fax or Network. 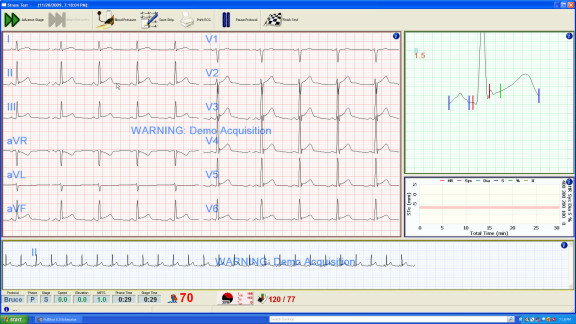 Post Test Review / Editing of ECG Data. Baseline Correction and other filters to minimize motion artifact. Speed Range: 0 - 12 mph.. Elevation Range: 0 - 25 %. Independent Treadmill Controller included which allows independent operation of Treadmill without Cardio Card Stress interface. A free Database Management System is included with this product! This integrates histories for all patients, whether stress or resting. We can fax you more details. Price does not include computer or cart.